The Fellowship was fortunate enough to obtain a copy of POSTAL: DOSSIER #1 from Image Comics. The story and dossiers are by Bryan Hill, Matt Hawkins, and Ryan Cady. The art is by Atilio Rojo, and letters by Troy Peteri. FBI Agent Simpson presents his report stating the existence of Eden; a town that doesn’t show up anywhere made of up criminals who help other convicts and operates away from the rest of the world. Simpson has made this investigation personal and wants to see things through to the raid, but things don’t turn out the way he hoped. I’m a sucker for these guidebooks, and this was a no-brainer considering the premise of the series. There’s a nice little cliffhanger leading back to the regular series, but I won’t spoil that. 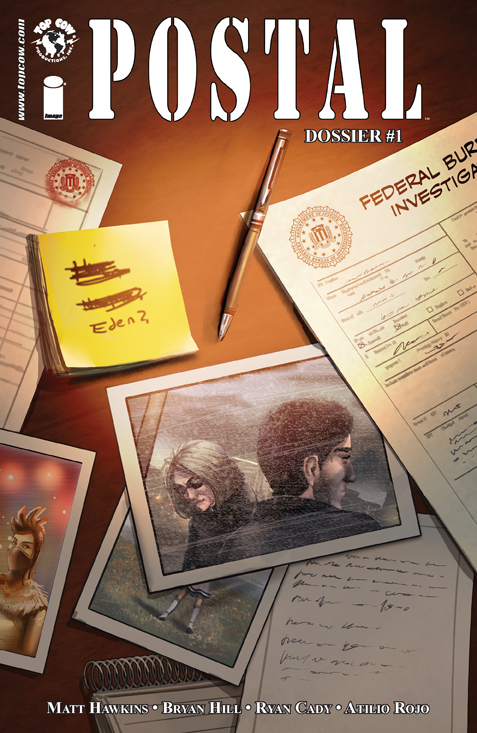 POSTAL: DOSSIER is a great pickup for the fan, or for someone who was curious about the book. POSTAL: DOSSIER #1 is in stores now, or available for ordering at www.imagecomics.com.